I grew up in Lincoln, Neb., went to Brown University and later went south to Mexico, Texas and Chile, reporting along the way, learning Spanish and meeting the woman who would become my wife. Now I report, tell stories, take pictures, tweet and more for the Standard-Examiner, a newspaper in Ogden, Utah. I write about Weber County and Ogden city government, immigration, the sizable Latino population here and the push to develop farmland to make way for homes, a touchy issue. Other topics have included the tragic death of a woman with dementia who inexplicably walked out of her home early one morning and froze to death, a group of riled citizens who launched a bid to halt construction of an amphitheater long after work started and a heated school bond issue that caused sparks in Ogden. ● My resume in PDF and Google documents (or read on). I write about politics, people, government, immigration, development and more in Ogden and Weber County, home to some 250,000 people along Utah’s fast-growing Wasatch Front. I knock on doors, seek out public records, attend meetings, work the phones, track social media and read lots of documents to get the story. I regularly handle my own photography, sometimes craft videos and actively use social media — Twitter, Facebook, Instagram. I also turn data into tables with Infogram.com. I’m versed in content management systems Libercus and WordPress as well as Excel, Google Drive, DropBox, Pixlr Editor and much more. The Elkhart Truth, daily newspaper — Elkhart, Ind. 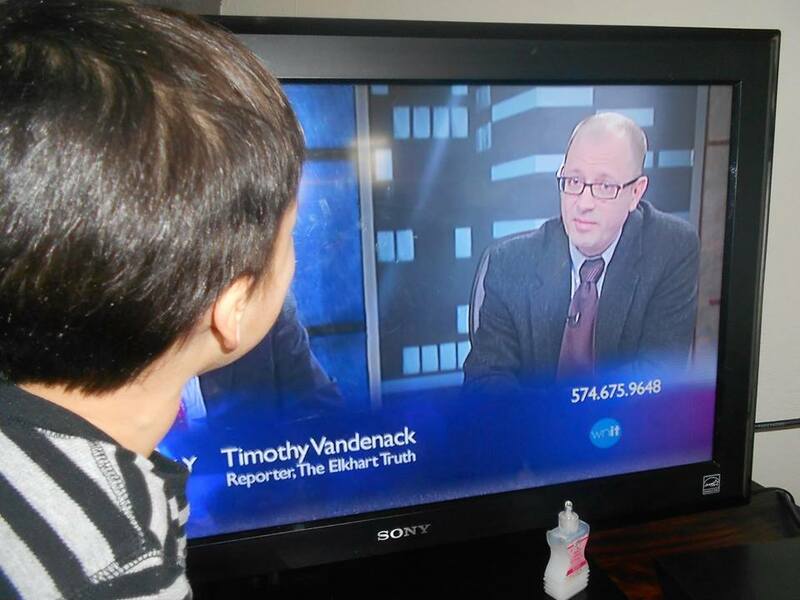 On WNIT’s Politically Speaking, 2014. I covered city government in Elkhart, a city of some 52,000. I wrote about national and state issues as they pertain to Elkhart County, kept a blog, focused on people, crunched numbers to make graphics, harnessed social media. Before that, I covered Elkhart County government. I wrote about Obamacare, undocumented immigrants, property taxes, local tea party activists and roundabouts. I helped with packages on the aftermath of the Great Recession, dreamers, the heated tussle between a wood-recycling firm and neighbors. I appeared several times as a political analyst, particularly around election time, on Politically Speaking, a program on the local PBS station, WNIT. I made videos with iPhone/ReelDirector, live tweeted, took and edited photos, handled spot coverage for ElkhartTruth.com. The aim, always, was to inform and connect with readers. I used Instagram, Twitter/Hootsuite, Infogr.am, Google+, Tumblr, Facebook, YouTube, LinkedIn. The Hutchinson News, daily newspaper — Hutchinson, Kan.
With Gov. Sebelius, Dodge City, Kan. I covered 24 southwest Kansas counties out of a one-man bureau in Dodge City — the politics, scandals, quirks. 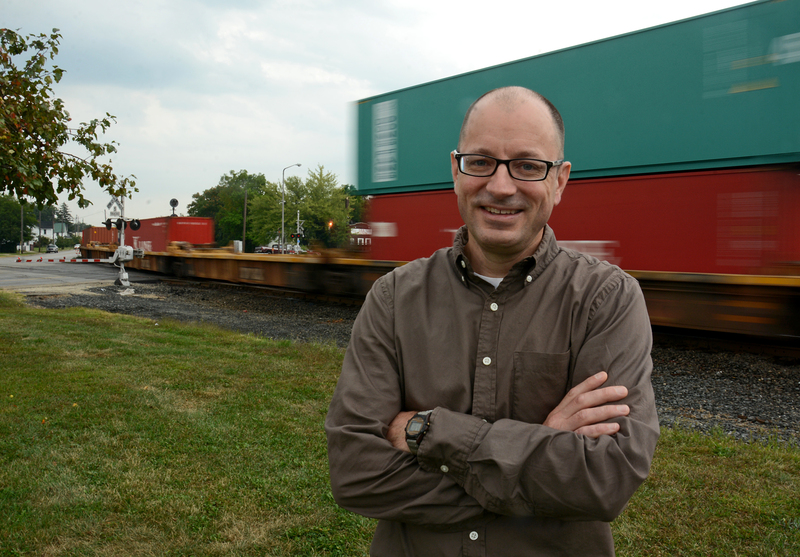 I wrote extensively about the Hispanic immigrant population, drawn by meatpacking jobs. Other topics — a 14-year-old junkyard operator, life for the zone’s homosexuals, the flap surrounding a principal accused with sexually harassing students, moves to lure ethanol plants. I regularly beat local and area media. 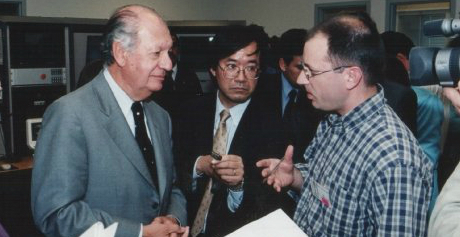 With Chilean President Ricardo Lagos, 2002. I traveled up and down long, skinny Chile, writing about moves by the Mapuche Indians to recoup land lost to colonization, former dictator Augusto Pinochet’s legal woes, efforts to promote Antarctic tourism via Chile, the telecom sector. I developed contacts in the Chilean government, non-governmental agencies, the telecom industry, working both in English and Spanish. I was assigned to McAllen City Hall, but also kept tabs on the booming border zone’s infrastructure needs, trade issues. Specific topics included a red hot mayoral race and the longtime incumbent’s defeat, clamoring in a neighborhood prompted by natural gas drilling and happenings across the Rio Grande in Reynosa, Mexico. 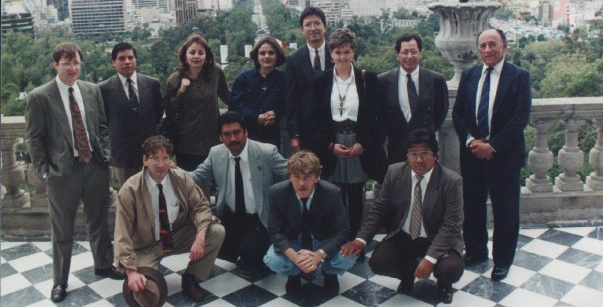 UPI, Mexico City, 1995. I’m on the left. I followed elections and politics, edited copy from reporters based all over Latin America. 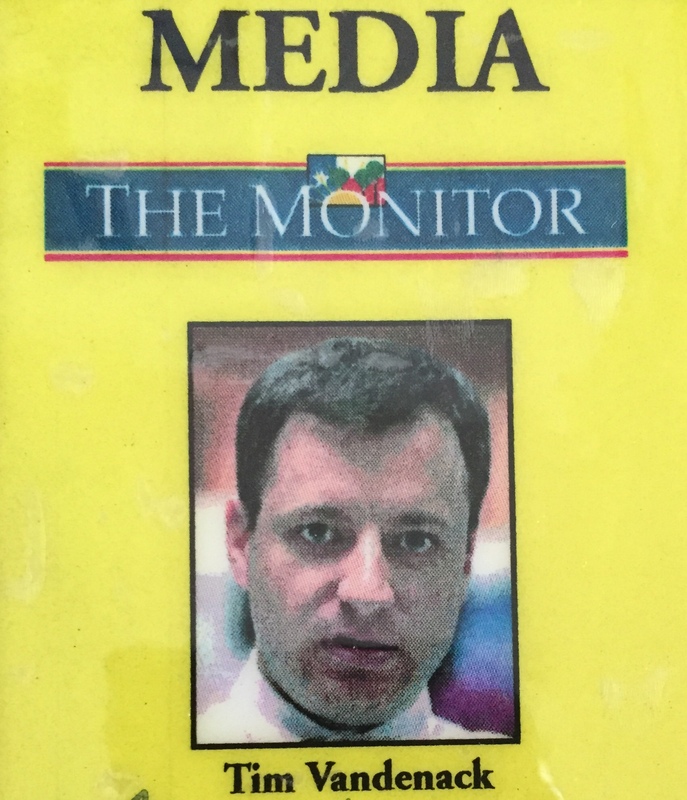 I also took to the road, covering Pope John Paul II’s 1996 tour of Latin America, Haiti’s 1995 presidential vote from Port-au-Prince and February 1994 peace talks in Chiapas between the Mexican government and Zapatista rebels. Second place, general reporting, series or package, Society of Professional Journalists Colorado Top of the Rockies contest, 2018, for a package of stories for the Standard-Examiner on Central Americans in northern Utah, zeroing in on the gang violence they face in their home countries. I and the photographer were named recipients. Second place, health reporting, Society of Professional Journalists Colorado Top of the Rockies contest, 2018, for a story for the Standard-Examiner on an uninsured woman’s efforts to secure health coverage for breast cancer treatment. First place, best enterprise reporting, Indiana Associated Press Media Editors, 2016, for Down But Not Out: Life in south-central Elkhart, a series on a older, low-income Elkhart neighborhood. I was a key writer and one of two named recipients. The series also won first place, best multimedia story-telling. Outstanding Achievement Award, Elkhart Truth, 2015, for my work on the 5 Years Later series, a look at the impact of the Great Recession to Elkhart, and other efforts. Kent Cooper Award, Indiana Associated Press Media Editors, 2015, for the 5 Years Later series. It was a newsroom effort and I was one of three named recipients for the award, IAPME’s top honor. The series also took first in the IAPME feature series category and second, best news coverage with no deadline pressure, Hoosier State Press Association, 2015. Second place, best ongoing news coverage, Hoosier State Press Association, for my reporting on Elkhart County Sheriff Brad Rogers’ controversial 2014 visit to the Nevada ranch of Cliven Bundy, embroiled in a conflict with the federal government. Second and third places, best feature series, Local Media Association, for two Elkhart Truth series I wrote, on the struggles young undocumented immigrants face, in 2013, and how some of those hit worst by the Great Recession here managed in its aftermath, in 2012. Joan M. Friedenberg Online Journalism Award, National Press Club, 2009, for “The Elkhart Project,” an MSNBC.com-led initiative with the Elkhart Truth on the impact of the economic downturn to Elkhart. I was one of eight MSNBC.com and three Truth reporters named in the honor. First place, best community service, Hoosier State Press Association Better Newspaper Contest, 2008, for Crossing the Divide, a several-months long look at the growing Latino immigrant population in Elkhart County by the Elkhart Truth. I was one of a team of reporters involved in the series. Newsroom Staffer of the Year, the Elkhart Truth, 2007-2008. Impact award, Kansas Equality Coalition, April 2007, for coverage of southwest Kansas’ homosexual community at the Hutchinson News after controversy erupted over the flying of a rainbow flag. Honorable mention, investigative story, Kansas Press Association, 2005, for a package of stories I co-wrote at the Hutchinson News on the dangers of meeting people over the Internet. My story focused on the murder of a teenage girl at the hands of a young man she met online. Honorable mention, news series, Kansas Press Association, 2005, for a package of stories I co-wrote at the Hutchinson News on the difficulties Latino immigrants face in seeking U.S. citizenship. Fluent in Spanish, competent with photography and video. Adept with budgets, numbers, spreadsheets. B.A. political science, May 1988, Brown University, Providence, R.I.